Hello! I've got a long and picture heavy post for you today. So, the BornPretty.com order is here and I get to show it to you, but first, so there is actually some nail art in this post, here is a design I did for a friend of mine. Pics are before cleanup so I'm sorry about that. He said he wanted something minecraft, maybe creepers so I went with that and used my horrid horrid black, which I fix later in this blog but unfortunately after I used it in this design, as much as I could because he used to love black polish. This is neon green (What A Shock!) with my Sally Hansen black Nail Art Pen for the creeper face and my horrid old Wet 'N Wild black, covered over with a matte finish. And now.. haul part two! 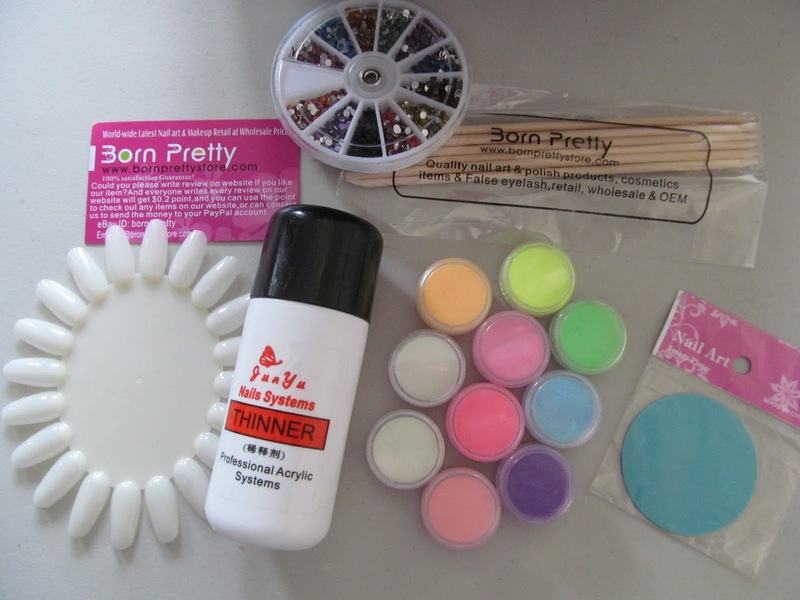 I bought thinner, orange sticks, rhinestones, a nail wheel, a stamping plate and glow-in-the-dark gel powder. It came all the way from Singapore so I wasn't surprised to find the powders had come loose from their package and some powder residue was scattered about but everything was still sealed tight and nothing was damaged. The Thinner was taped tight shut which was nice to see. I used the thinner right away on some black polish I've had for years and years that was so incredibly goopy it was practically unusable. Here it is, gooping it up. The Thinner stank to high heaven and I had to go out on the balcony to use it. It doesn't have a good delivery method either so I sort of just let it drip out in a kind of controlled manner down the rim of the top. Also, the text you see is all there is, so I don't know what is in it at all. Despite that, after a few drops I could finally hear the little ball bearing in my black for the first time in years and it is much more smooth and manageable now, so I'm happy. The stamping plate is adorable. I had to buy it even though I am pants at using it. I'll keep practicing, this new plate will give me a reason to get better at it and maybe eventually I'll succeed well enough to show you all. My failure at this isn't because I couldn't remove the sticker! I'm going to use the glow-in-the-dark powder on my current mani as soon as I've given it a day or so without for me to enjoy it, because I fear I won't succeed on my first attempt. You'll see it before and after soon so look for it! After getting all my new stuff together I looked into my current nail polish storage method and decided that enough was enough. Look at that, all messy and piled together and getting banged around all the time. I could never find anything and I'd get bubbles in my polish. Plus, I couldn't admire my stash! Tada! Much better, I don't have a huge collection, in fact I think it's pretty small compared to a lot of bloggers, but since I'm a poor student, fairly new at this and content to substitute acrylic for anything I don't have with my too much paint in the studio portion of my apartment I'm fine with that. You'll notice I've got the acrylic I bought specifically for my nails in there along with the brushes from before, until class starts in the fall it doesn't have anywhere pressing to be so there it is. Also, you can ignore my magic card decks below that, you can't see my whole collection so you can't tell I have a problem! Whew, and that's that. It had been a bit since I posted last but whoa, with this I feel like I made up for it. Hope you liked! Check out my post about the award, I have linked to your blog and now you can do the same for some of your favourites! Thanks a bunch! I passed it on, sure was nice to get.